QuantShares recently launched the U.S. Market Neutral Momentum Fund (MOM). 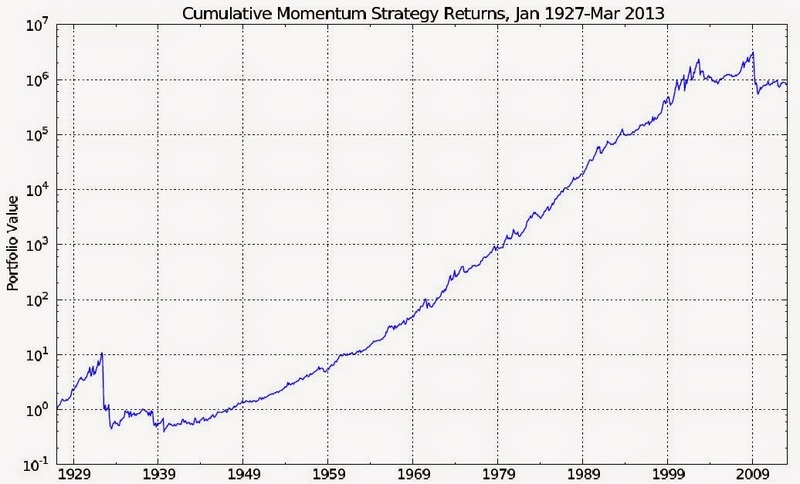 This fund comes close to replicating the strategy followed in many momentum research papers. From among a universe of the 1000 largest U.S. companies, the fund goes long the 200 strongest and short the 200 weakest companies based on 12 month performance with a 1 month lag. Positions are readjusted monthly and are filtered so as to be neutral with respect to sector weightings. The fund’s expense ratio (not including the extra costs of carrying short positions) is .81%. At first glance, I thought this might be an attractive portfolio addition for conservative investors given that market risk is offset by an equal dollar amount of short positions. I wanted to see the long term performance record of the underlying Dow Jones U.S. Thematic Market Neutral Index to judge the impact of management fees and monthly transaction costs, which could have a large impact on performance given monthly rebalancings. When I went to the QuantShares website to bring up the index values, I was surprised to see that the index has data going all the way back to….. August 2011. 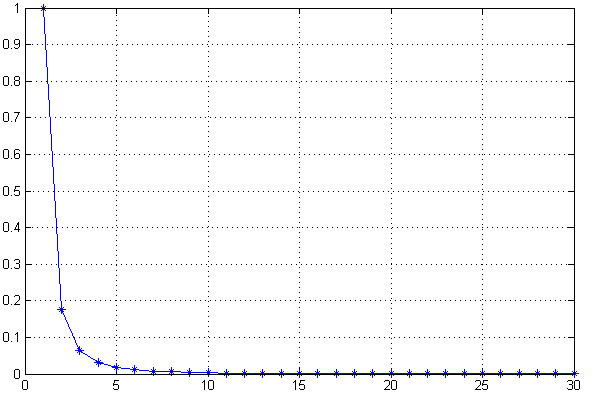 It would have been easy to construct and post index values going back 35 years instead of just 1 month. QuantShares also came out with other market neutral ETFs that base themselves on factors such as value, beta, size and quality. None of these has the same anomaly value as momentum. Even more surprising is the fact that QuantShares issued an anti-momentum ETF (NOMOM) that reverses the logic of their momentum fund. This must be for masochists who want a proven way to lose money. I’m still scratching my head about all this. I guess life is like a box of chocolates. You never know what you’re gonna get. For those want to see where academic momentum all began, the first published paper was in 1937. It was titled Some A Posteriori Probabilities in Stock Market Action by Alfred Cowles III and Herbert Jones. The Cowles Foundation for Research in Economics, which was formally at the University of Chicago and is now at Yale, was started by Cowles. Their impressive relative strength findings on 15 years of stock market data was remarkable, considering there were no computers in 1937. The next published paper on momentum was in 1967. It was Relative Strength as a Criterion for Investment Selection by Robert Levy. He also authored a book around the same time called The Relative Strength Concept of Common Stock Forecasting. Nicolas Darvas authored a book in 1962 called How I Made $2,000,000 in the Stock Market. It was anecdotal, but was based on momentum and was a great read when I came across it in the 1970s. Cowles, Jones, and Levy should have given efficient marketers some cause for pause, but such was not the case. 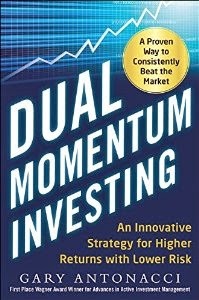 It wasn’t until 1993, with the publication of Returns to Buying Winners and Selling Losers: Implications for Stock Market Efficiency by Jegadeesh and Titman, that momentum started attracting serious attention from the academic world. This may have finally happened due to the pioneering work in behavioral finance by Tversky and Kahneman in the 1970s. Behavioral finance could now explain what the efficient market hypothesis could not. 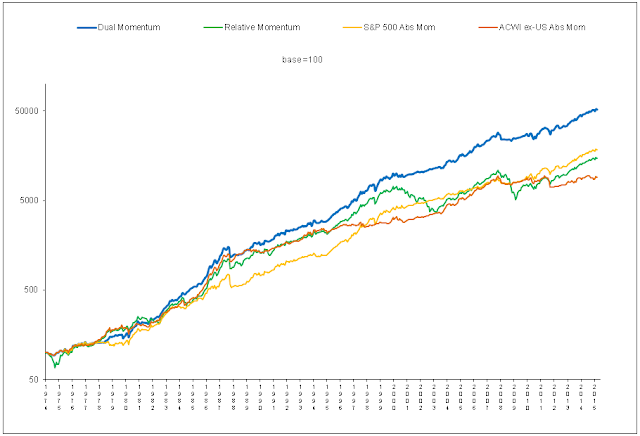 There are now over 1000 momentum research working papers and over 300 published in academic journals. For a list of some of the prominent ones, see AQR Capital Management’s Bibliography of Selected Momentum Research Papers.